Here at Eiff Aerodynamics we produce the finest quality sport parachutes. Our canopies and parachutes are designed with accuracy landing in mind. 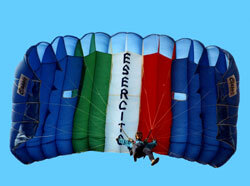 Our superior features allow the Classic to maneuver unlike other sport parachutes. We believe in our product and after trying one, we know you will too! Find the perfect Eiff parachute just for you today.